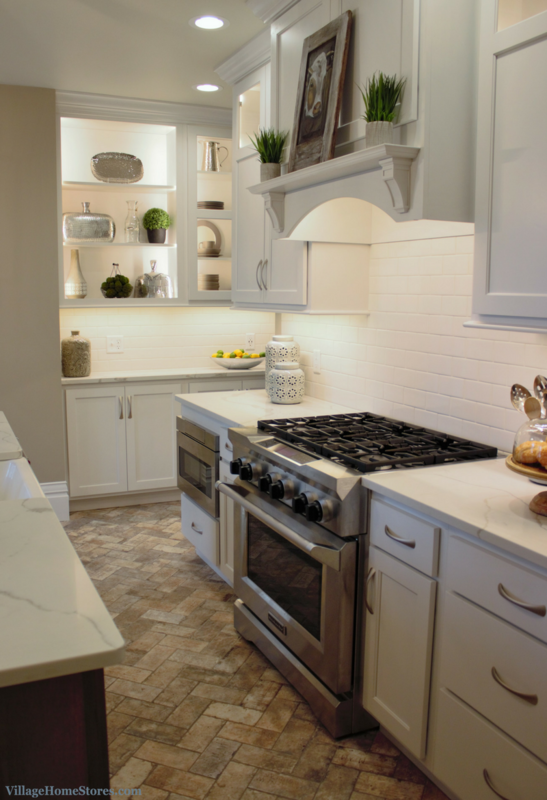 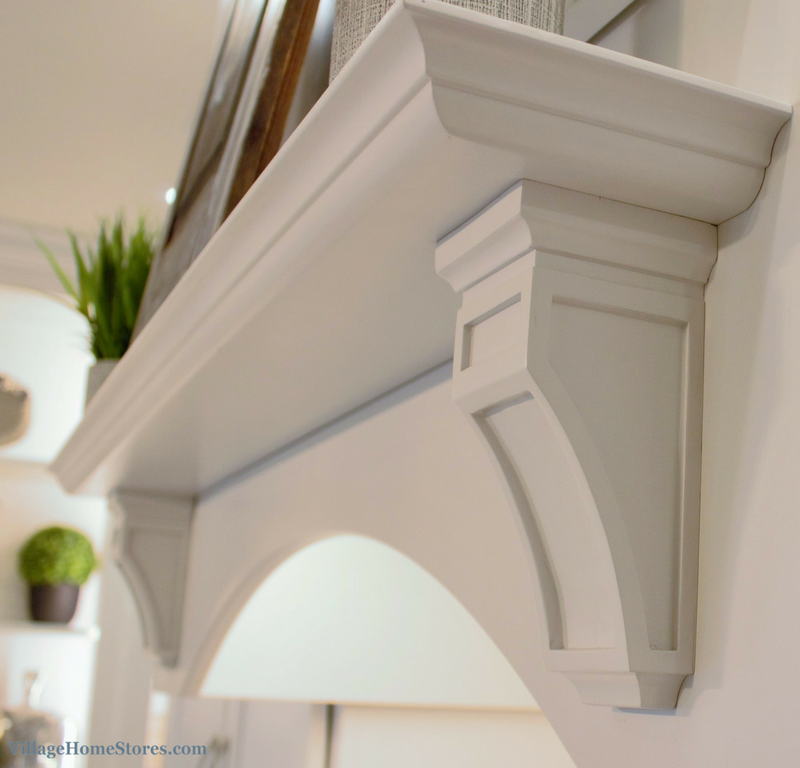 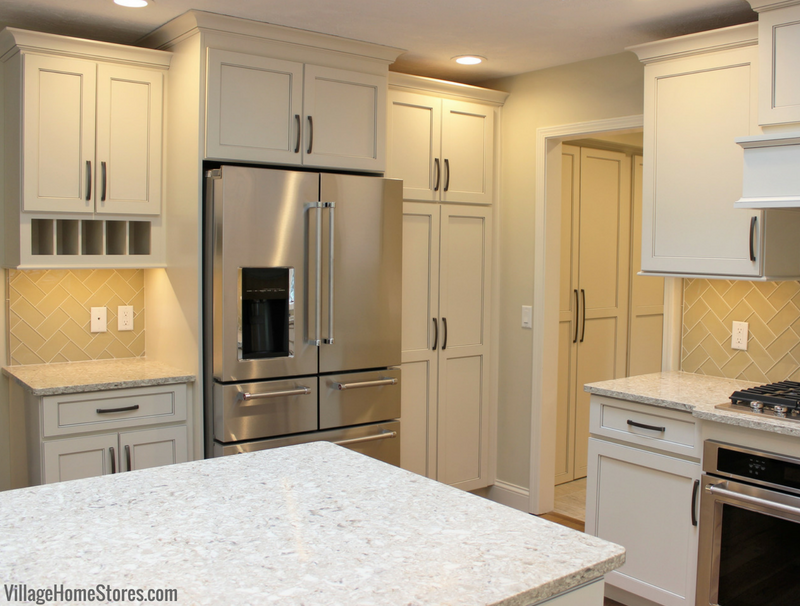 There is nothing more classic and transitional for a kitchen than a white painted cabinet. 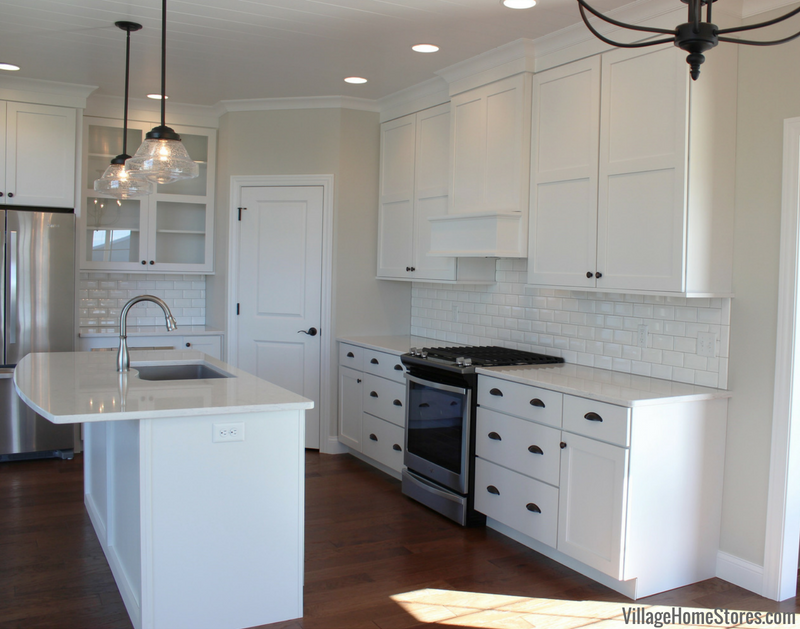 Add to that a glossy white subway tile and a shiplap ceiling and you have yourself a stunning design. 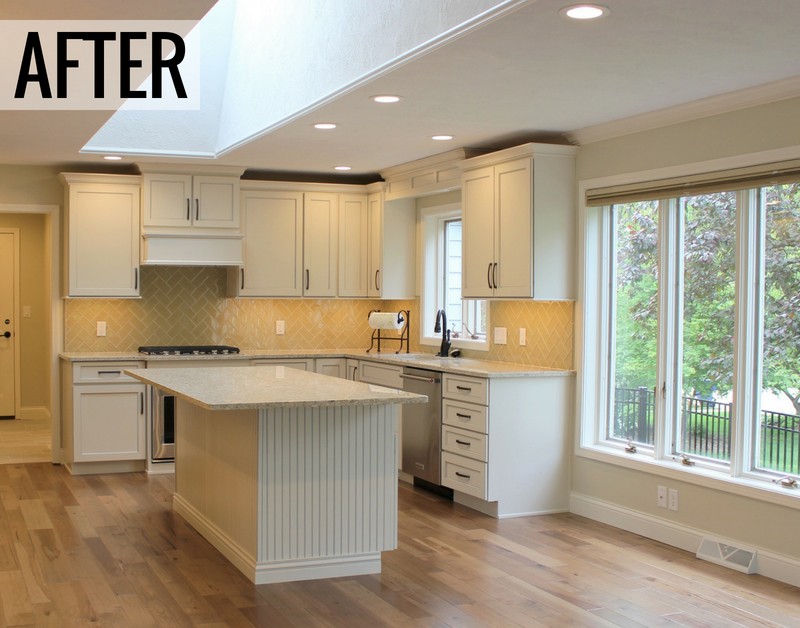 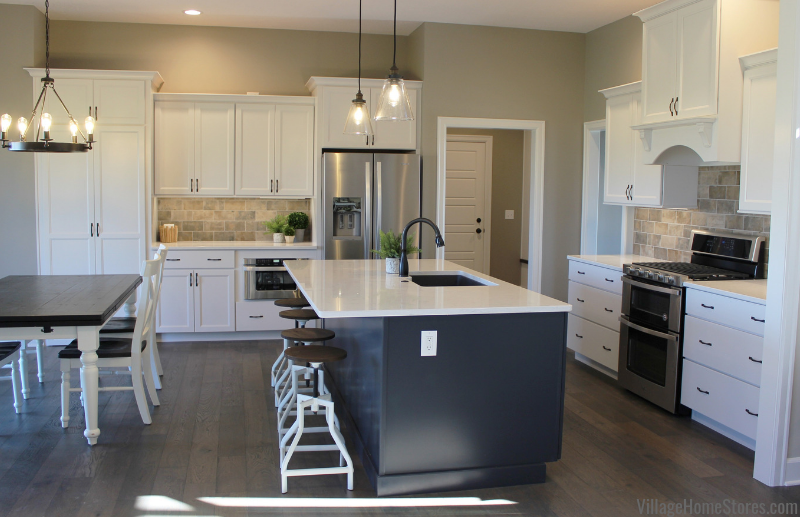 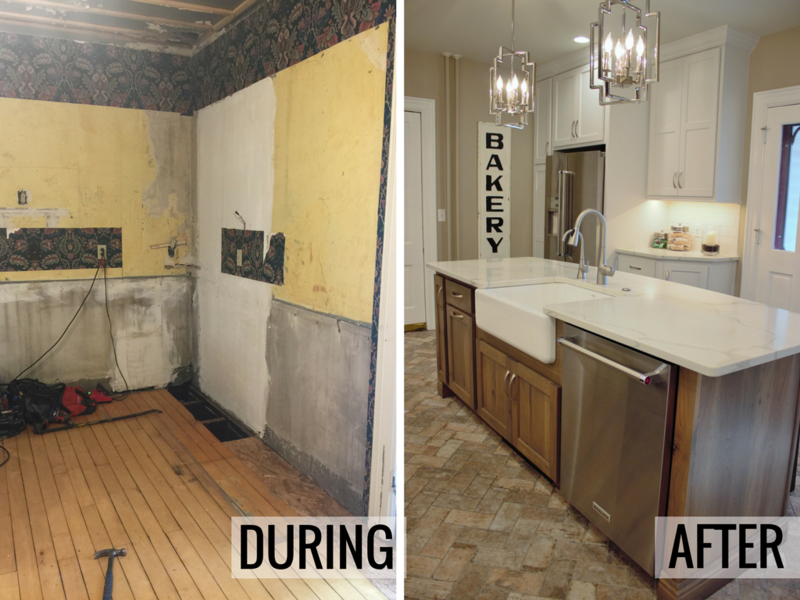 (Googles classic white kitchen) Results: this Bettendorf, Iowa kitchen in a home built by Aspen Homes LLC. 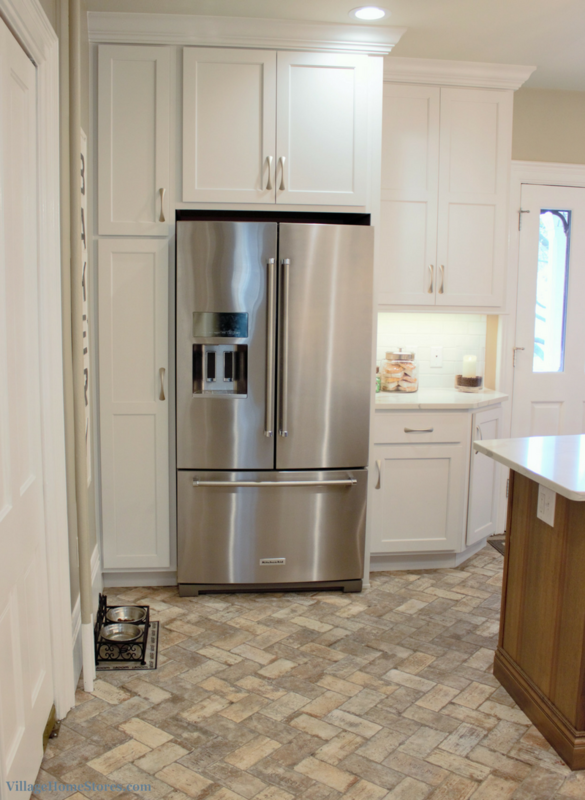 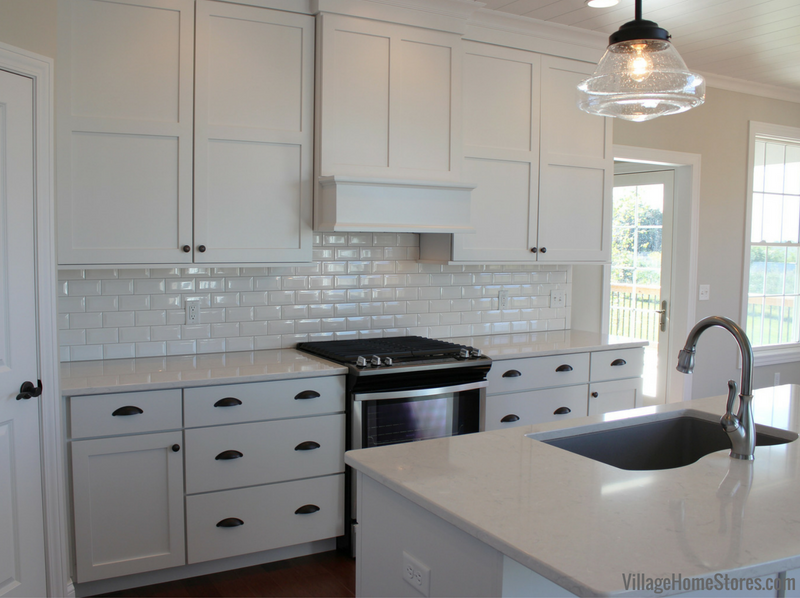 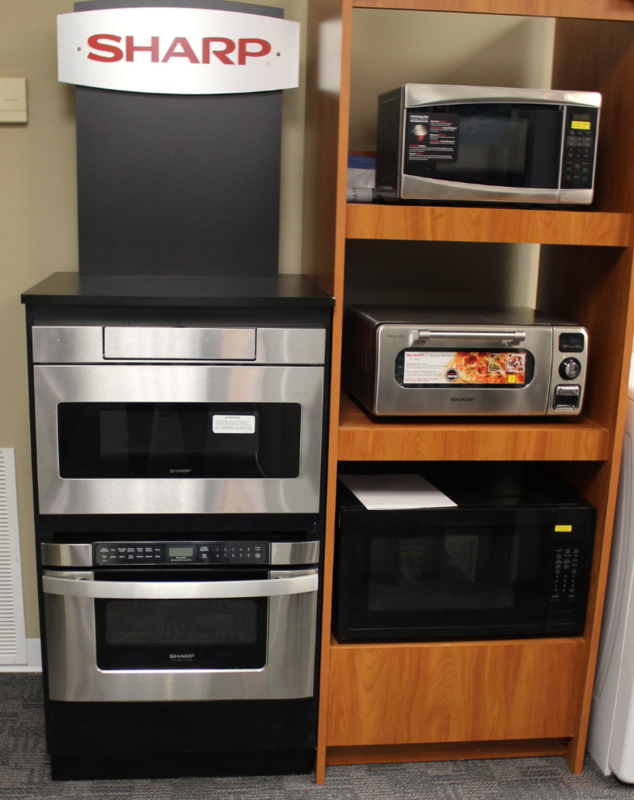 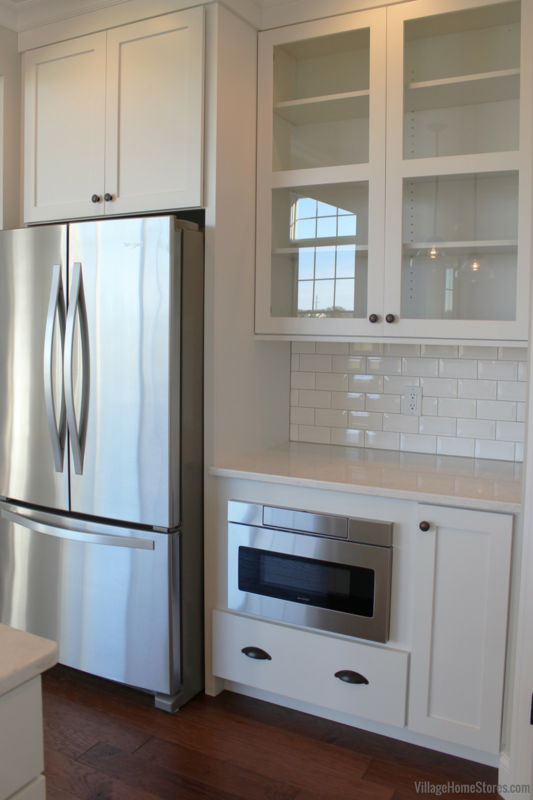 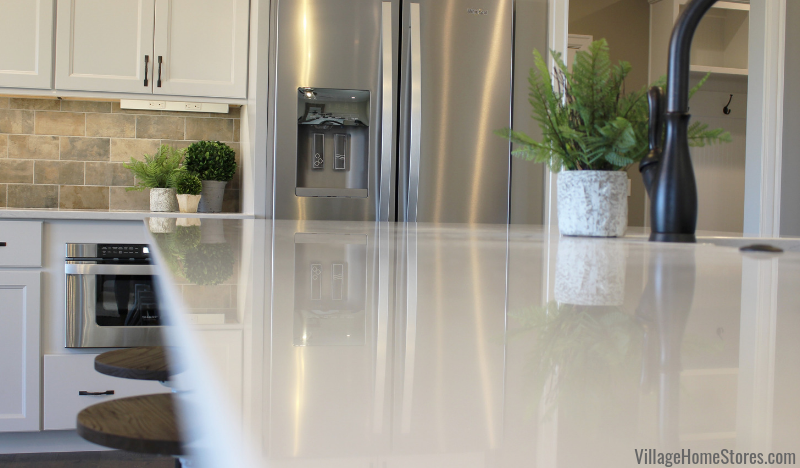 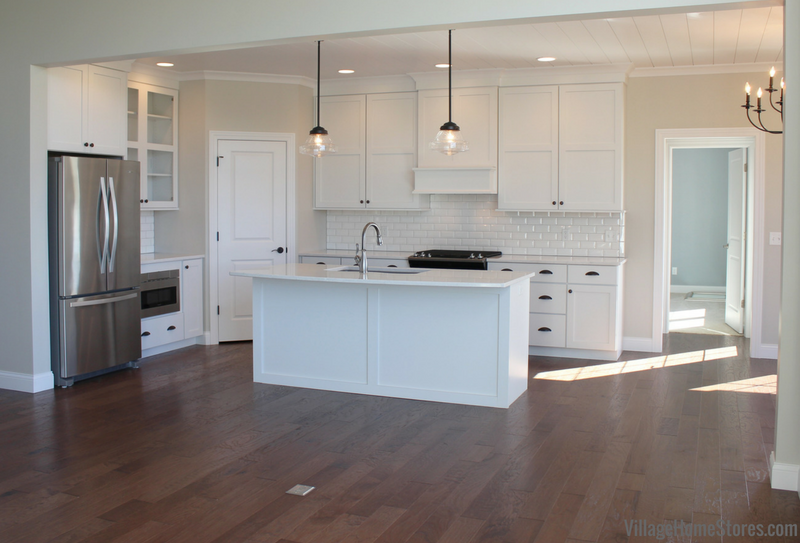 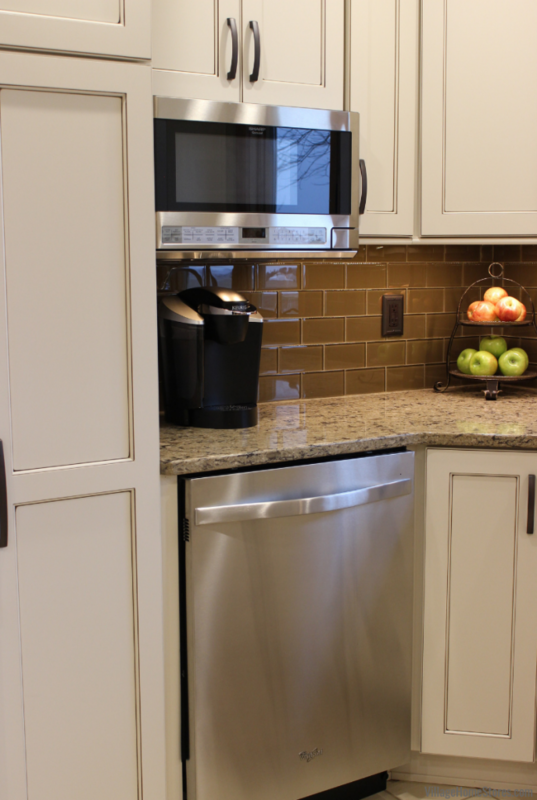 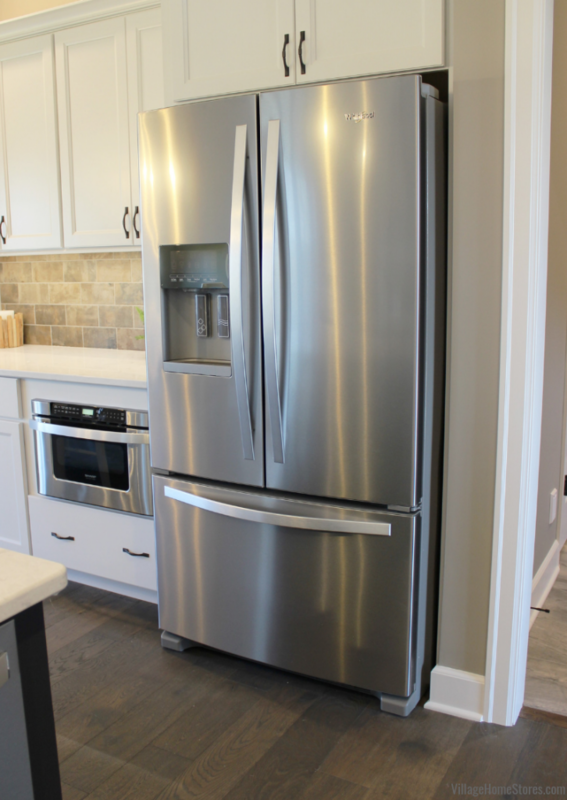 A white painted shaker-style door and a package of Stainless Steel appliances by Whirlpool. 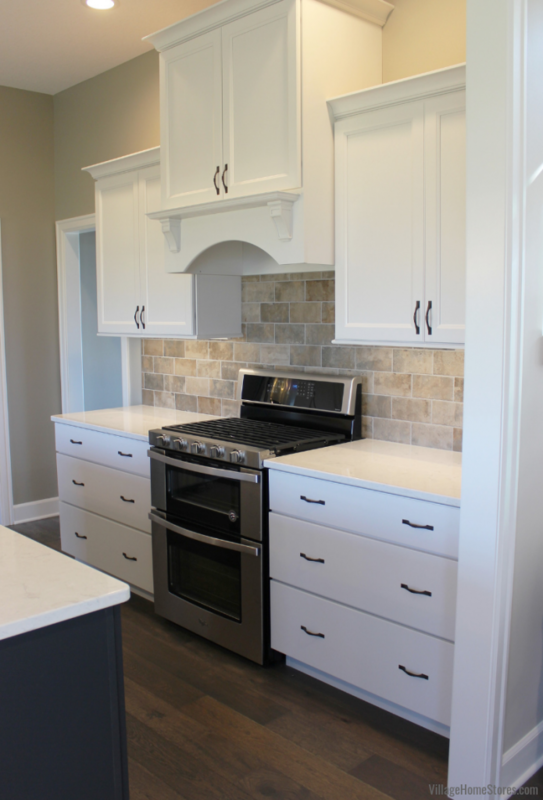 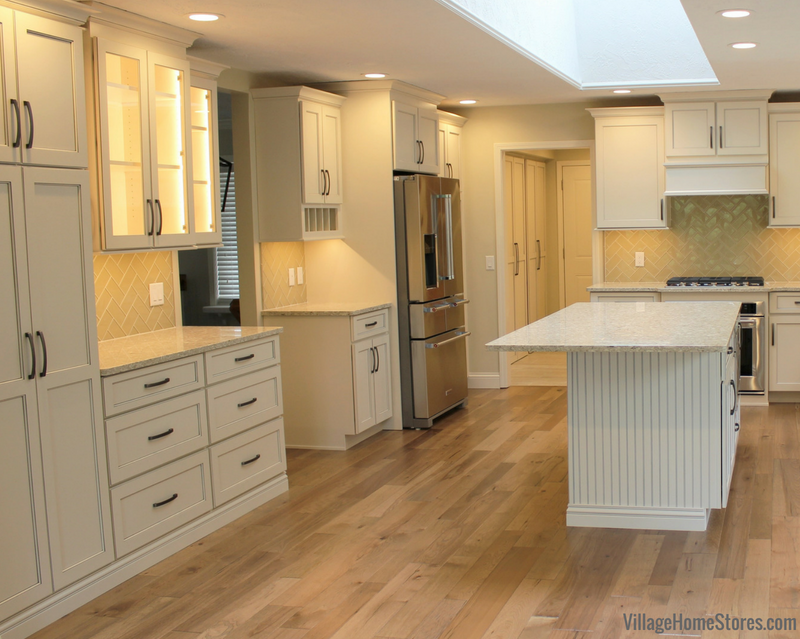 The cabinetry is from our Koch Classic line in the Savannah Door and Maple wood White Paint. 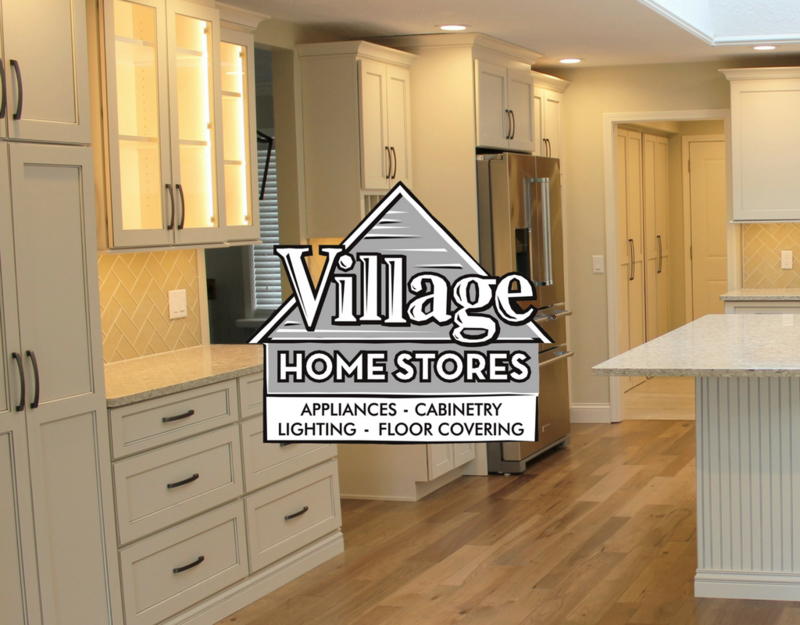 Your designer at Village Home Stores will discuss with you how a tall wall cabinet door may look in your doorstyle. 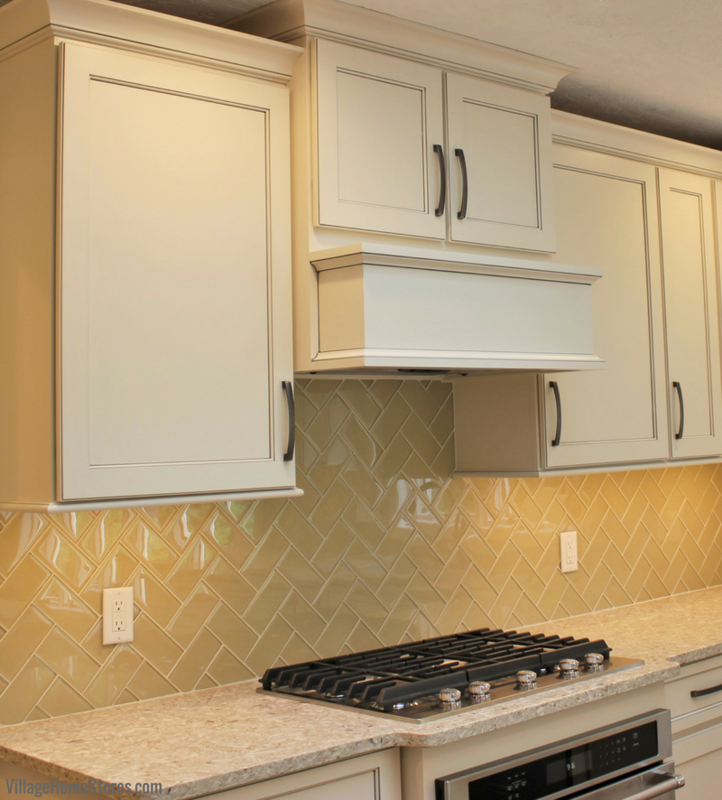 In some cases, you may have a choice of layout or want to select another option. 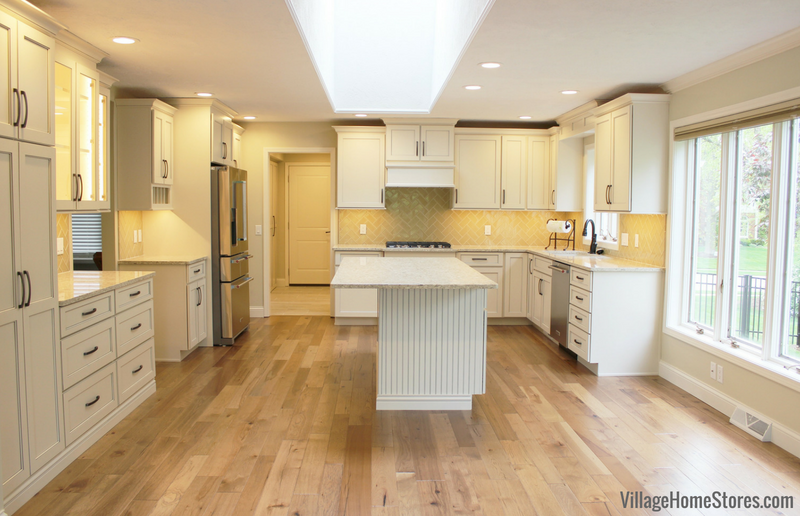 We love the symmetrical look of these center divided doors. 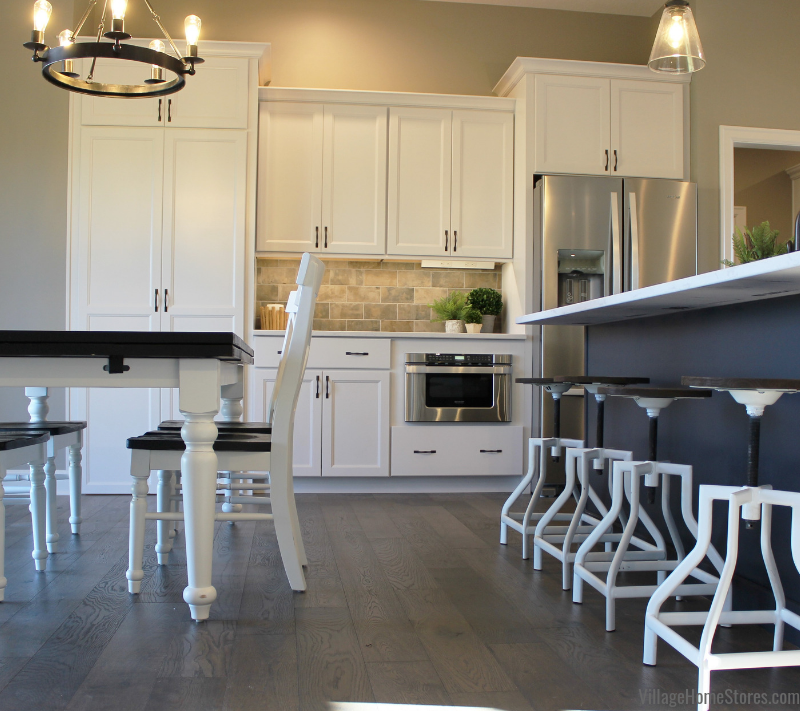 Speaking of symmetry, the cooking zone of the kitchen is a bright and balanced design. 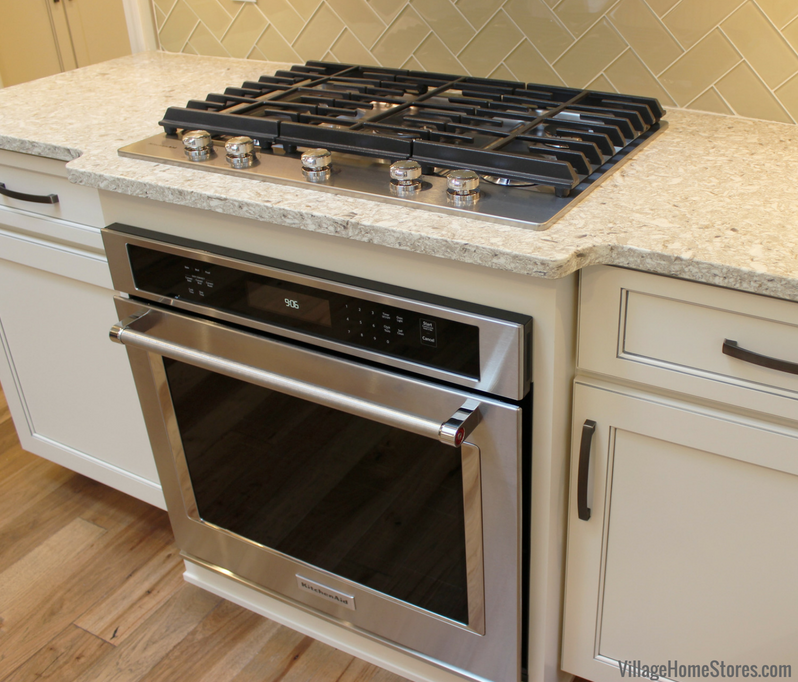 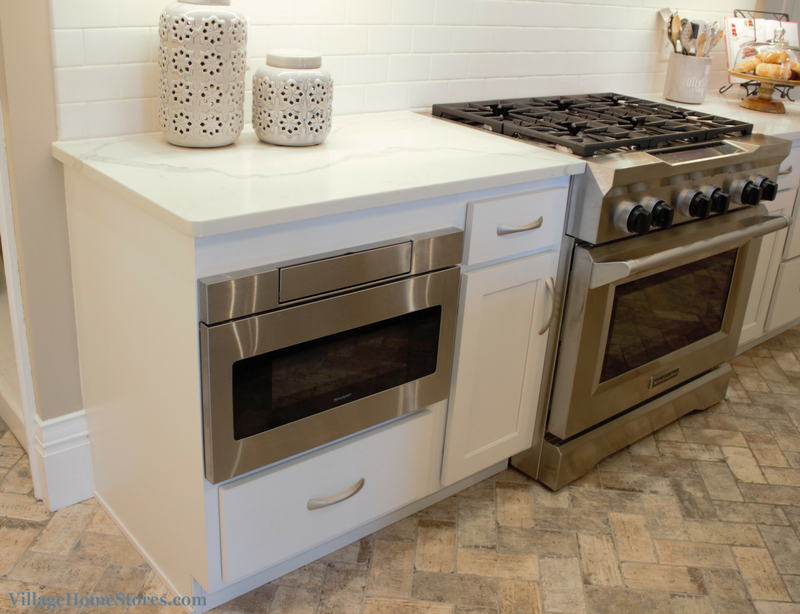 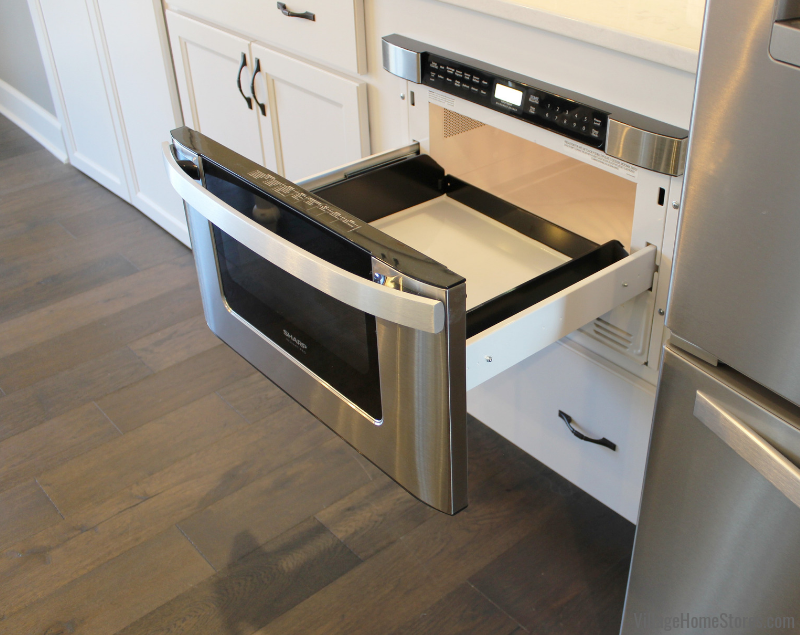 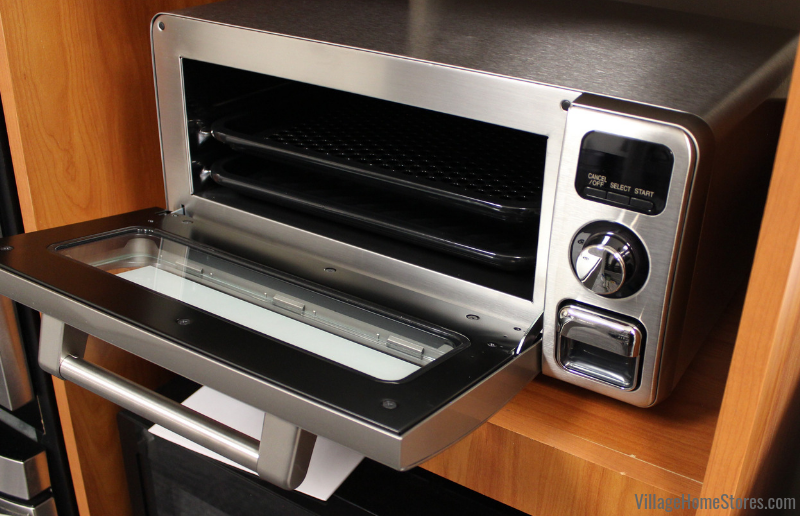 Whirlpool’s front-control gas range is a clean slide-in look and lets the backsplash shine. 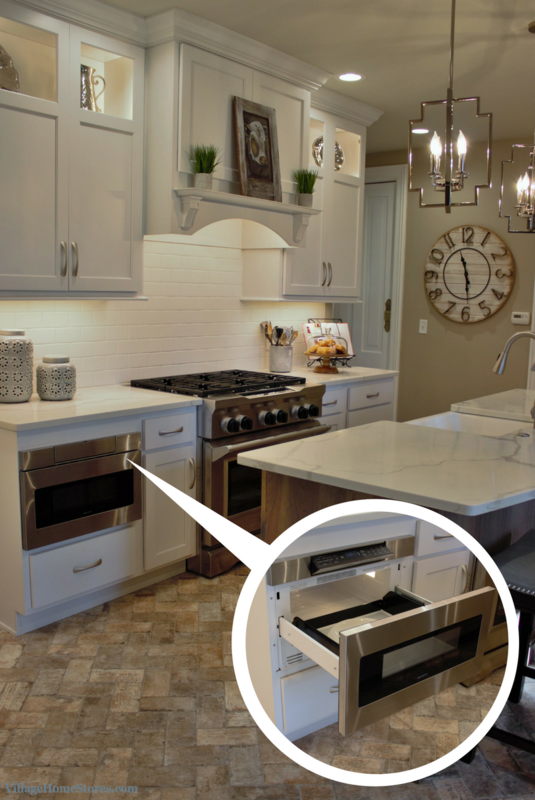 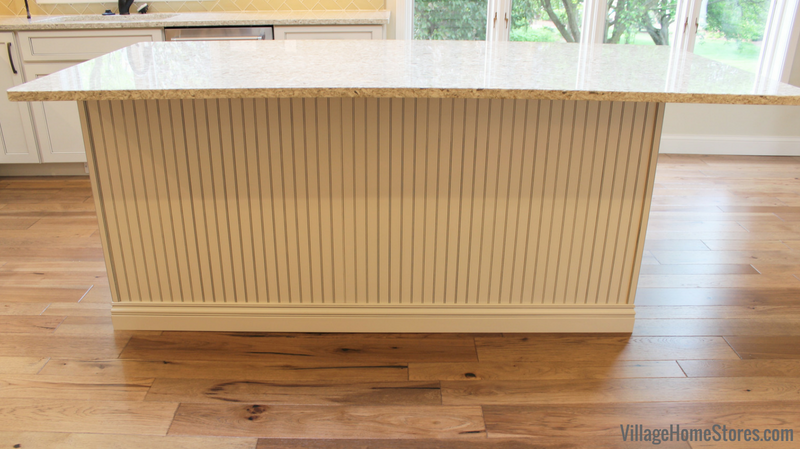 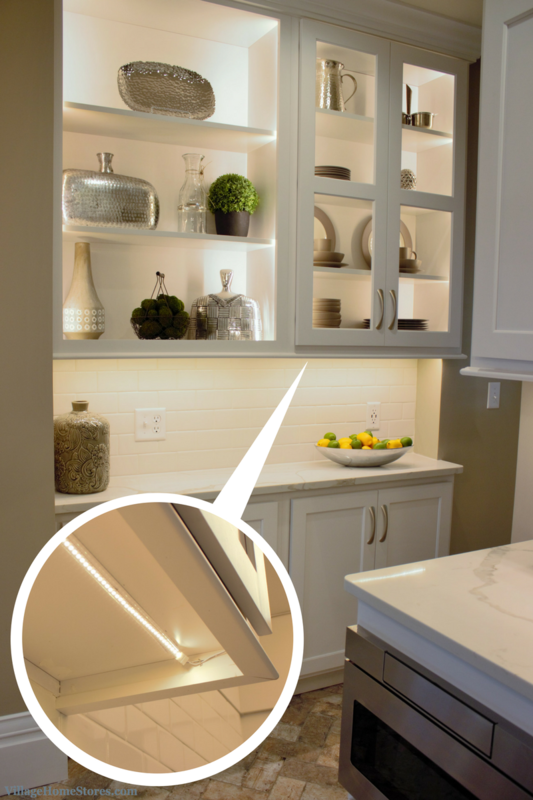 A wood hood offers a clean and customized look and has been fit with a Broan insert. 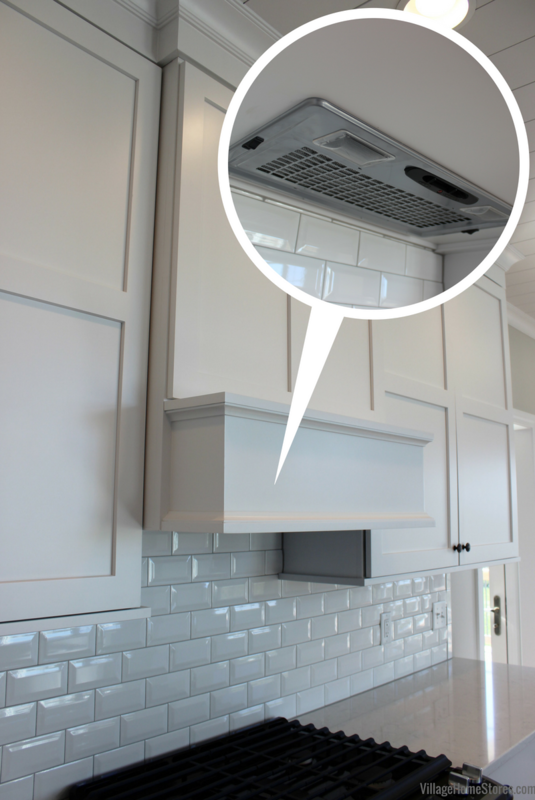 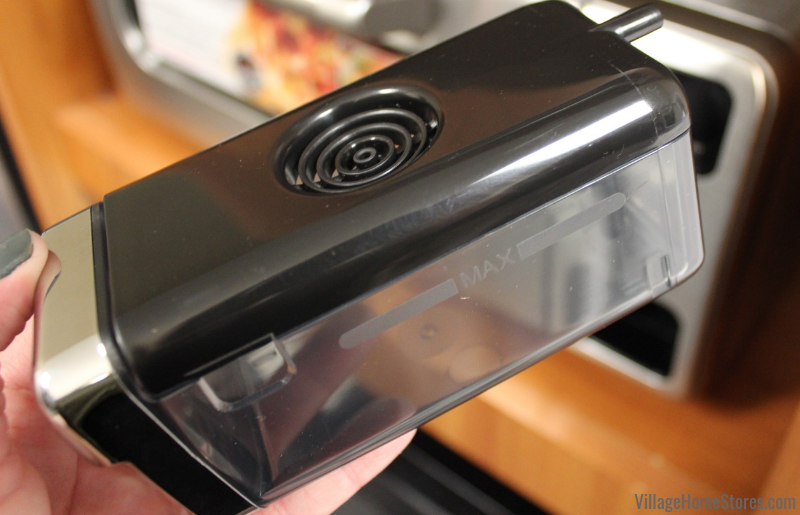 This insert boasts 390 CFMs for ventilation when needed. 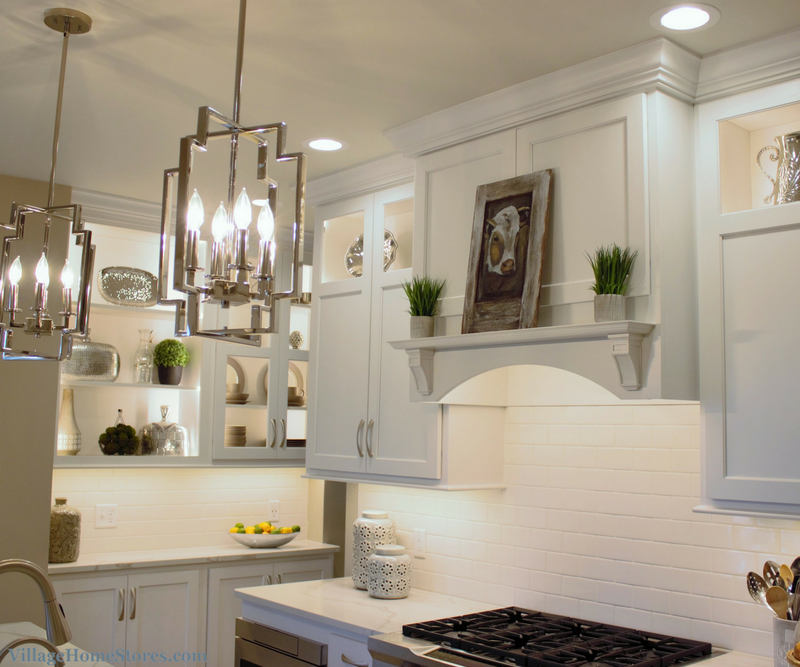 Tone-on-tone designs can be so clean and calming for a busy household. 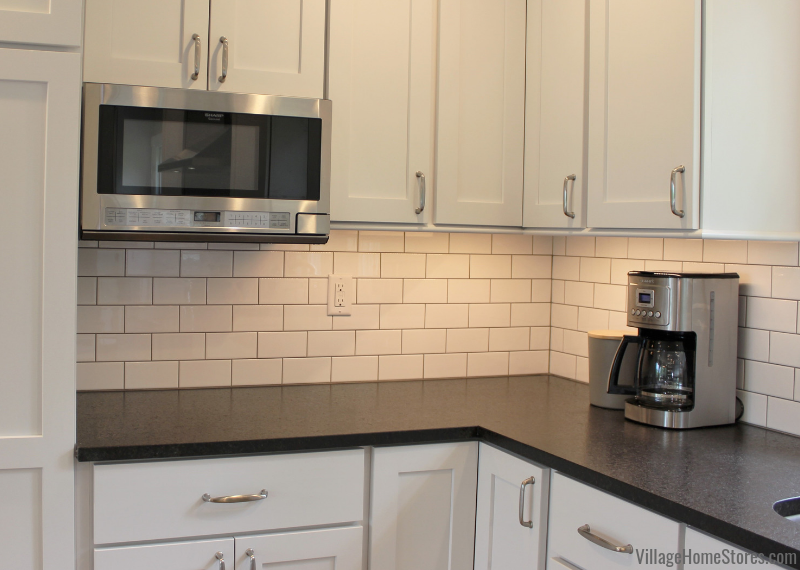 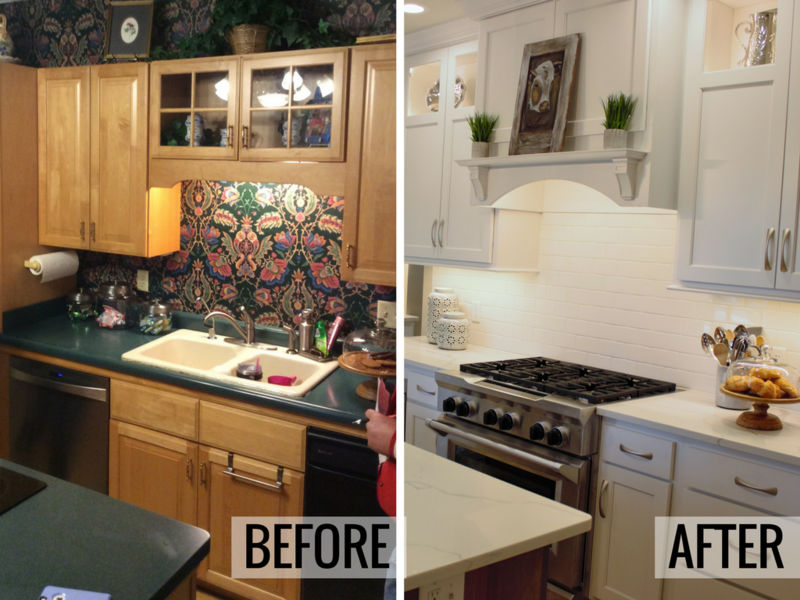 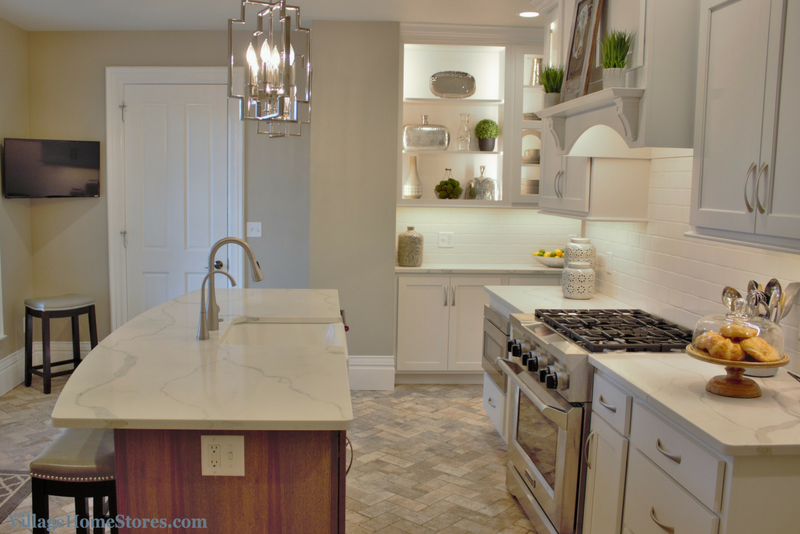 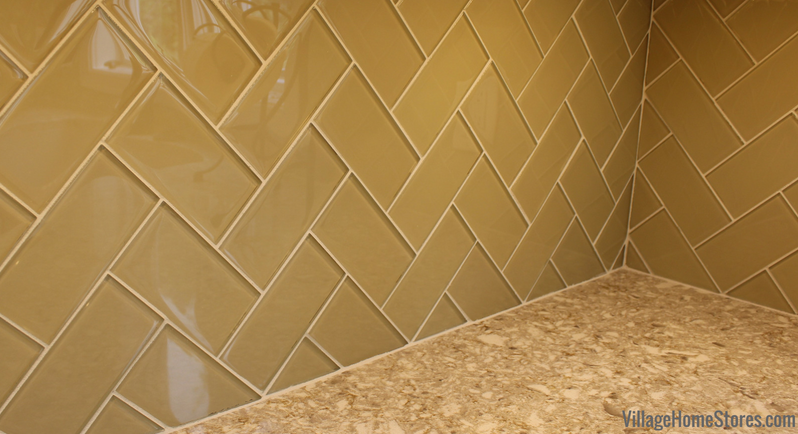 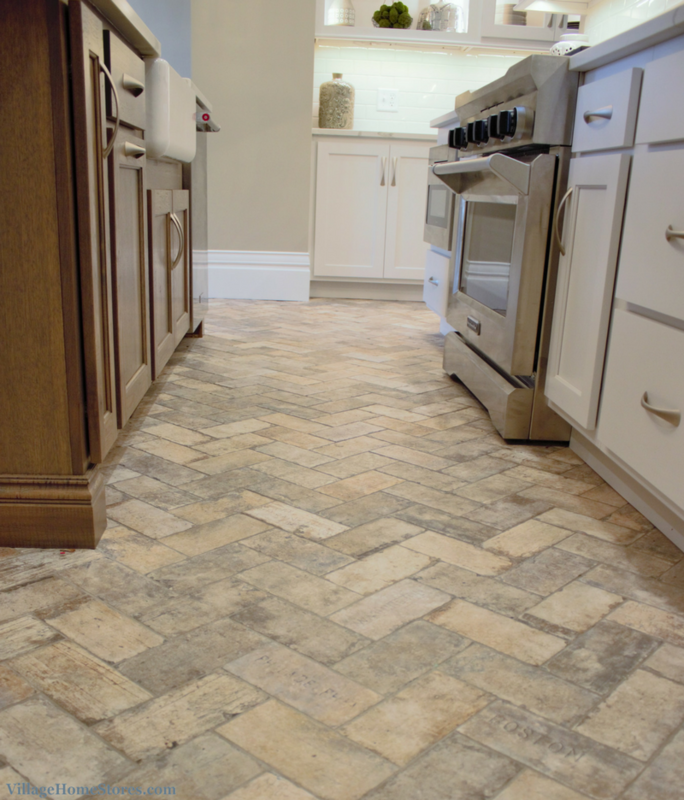 As a modern and updated twist on a classic subway tile, these tiles are a beveled style. 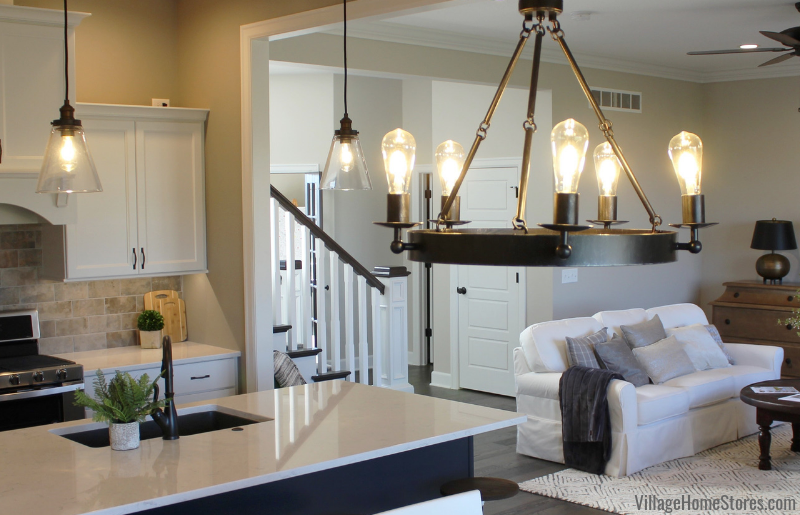 This look allows light to bounce around and adds a lot of texture to the design without adding another color. 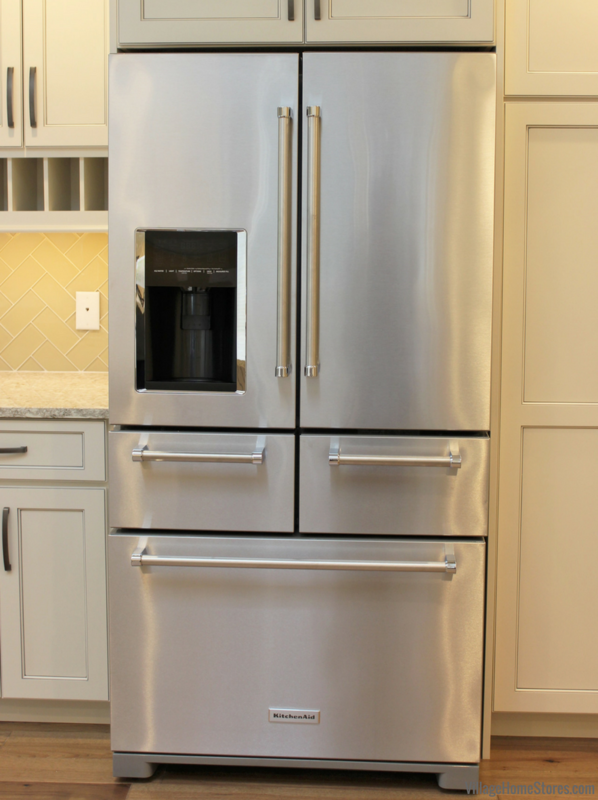 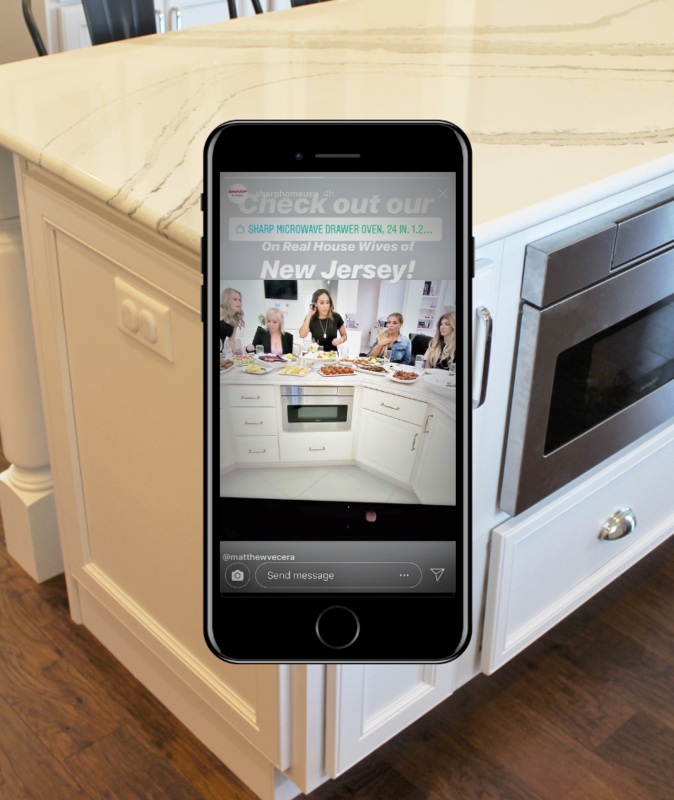 A section of glass doors is found on the wall that hosts the refrigerator and microwave drawer. 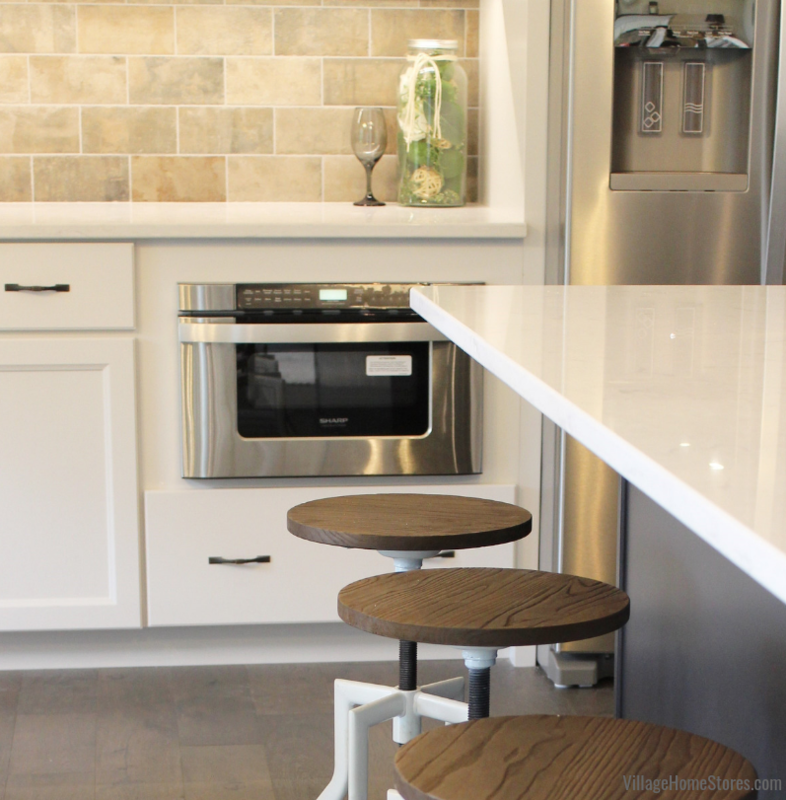 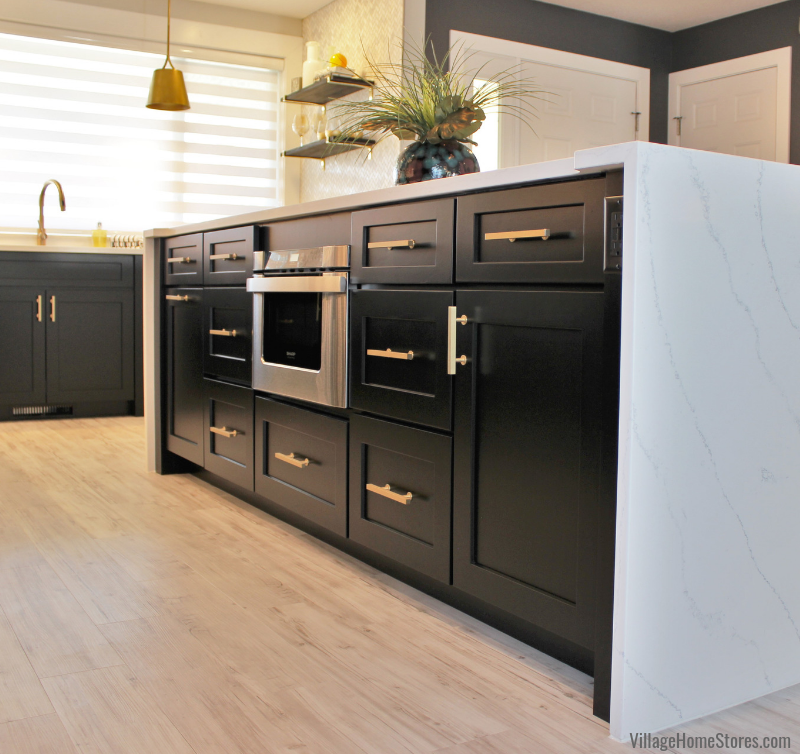 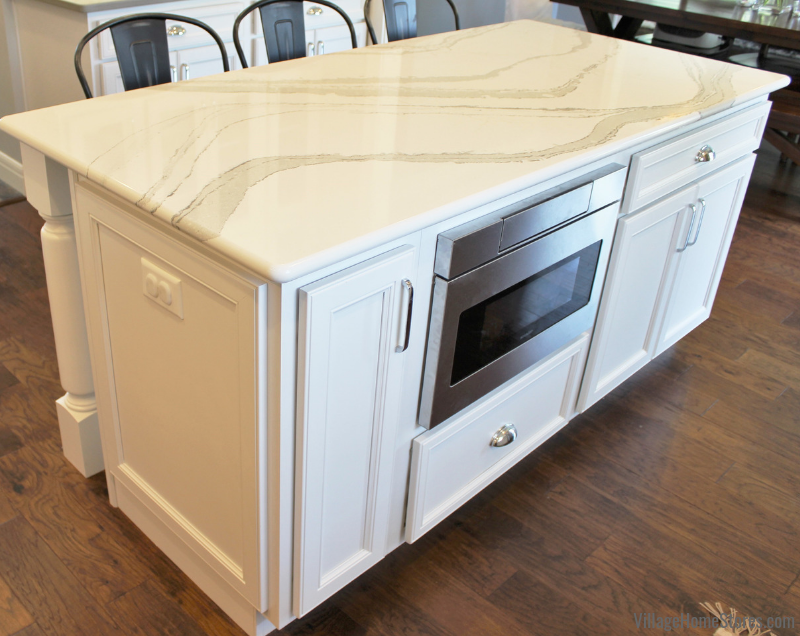 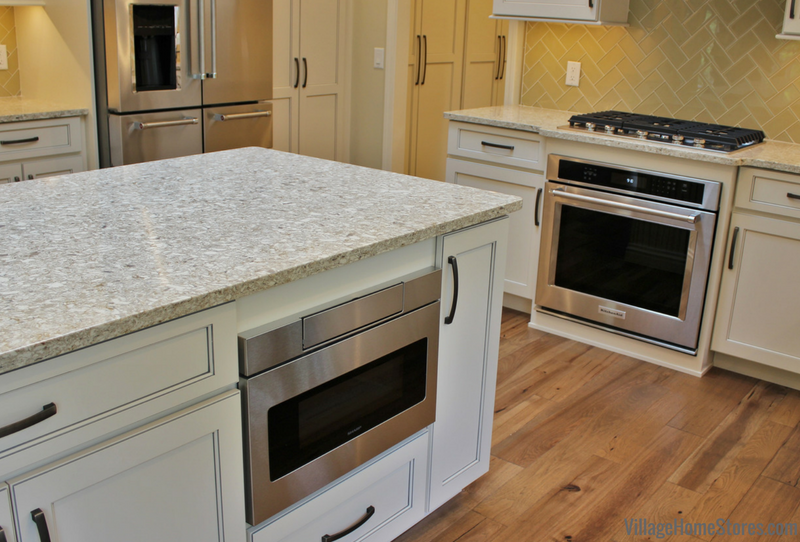 A classic look of marble with the maintenance-free benefits of quartz. 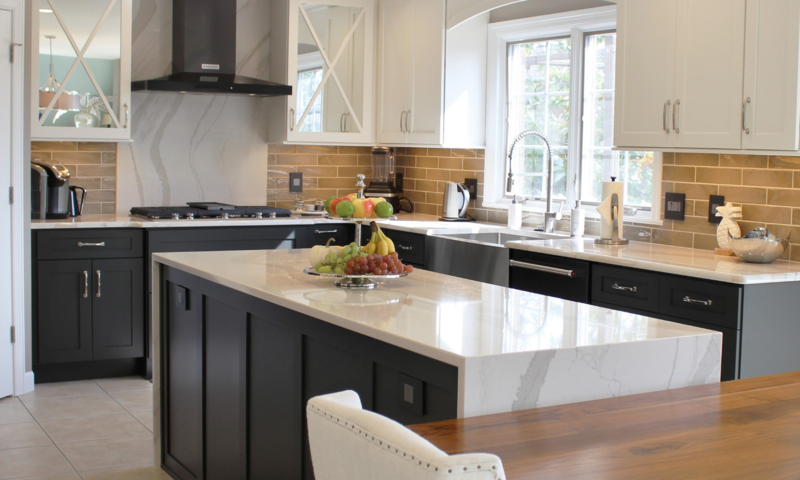 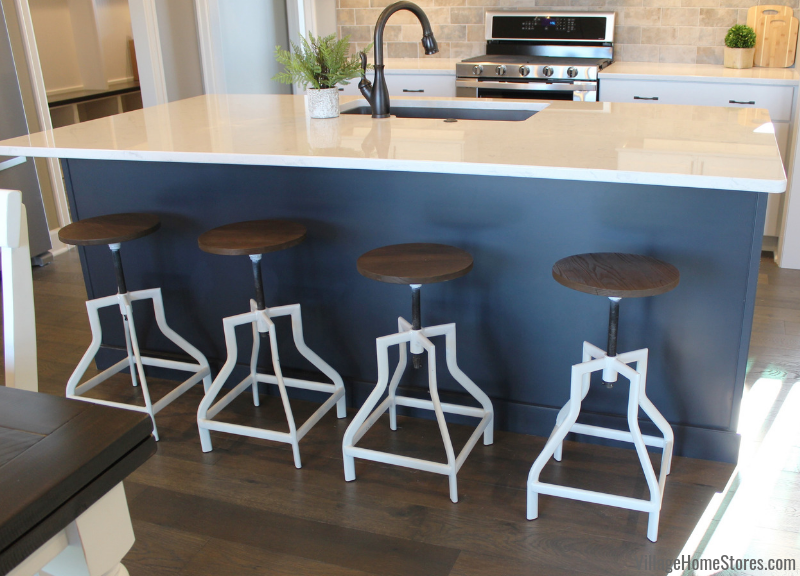 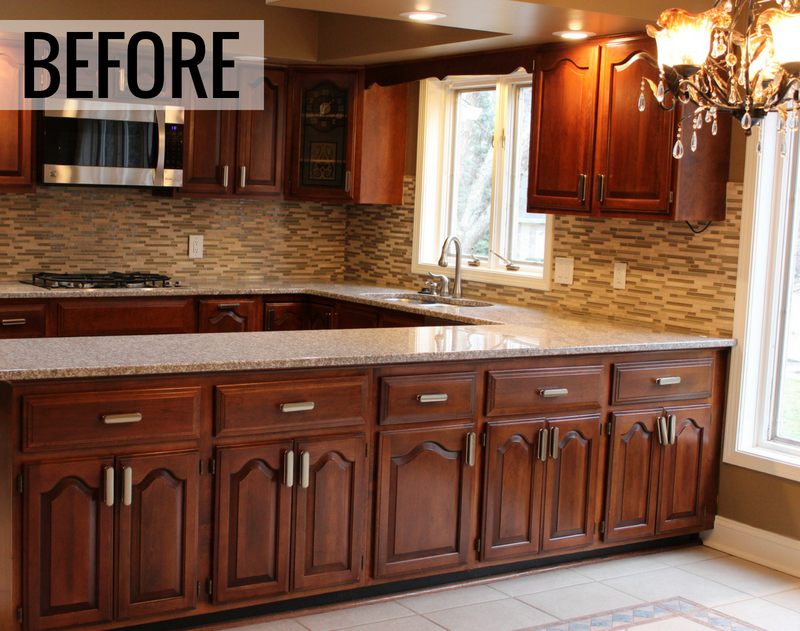 The counters throughout this kitchen are by Cambria Quartz in the Swanbridge design. 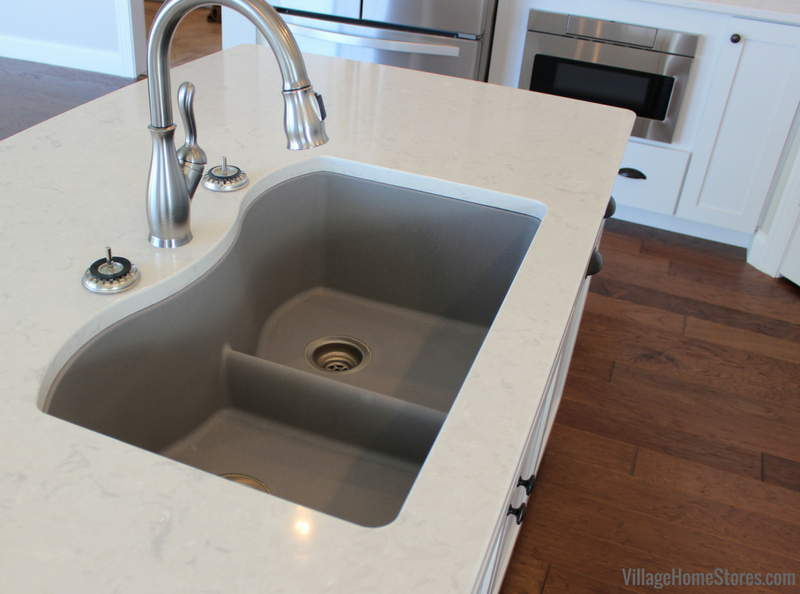 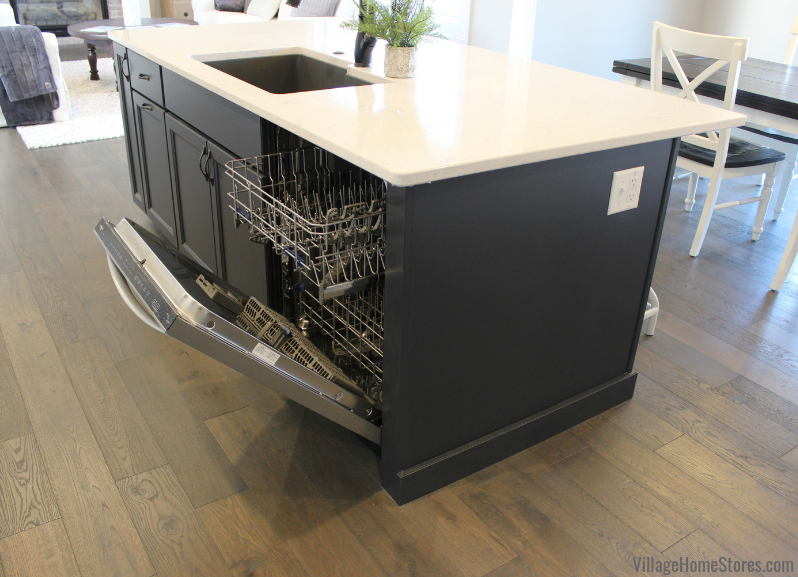 An undermounted sink in an e-granite material gives a softer, more matte finish look. 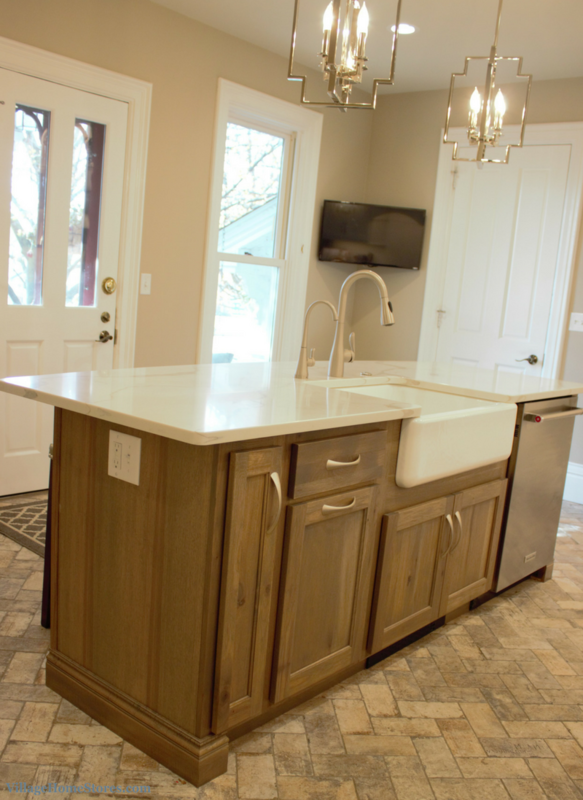 Notice that the center divider in this Elkay sink is lowered? 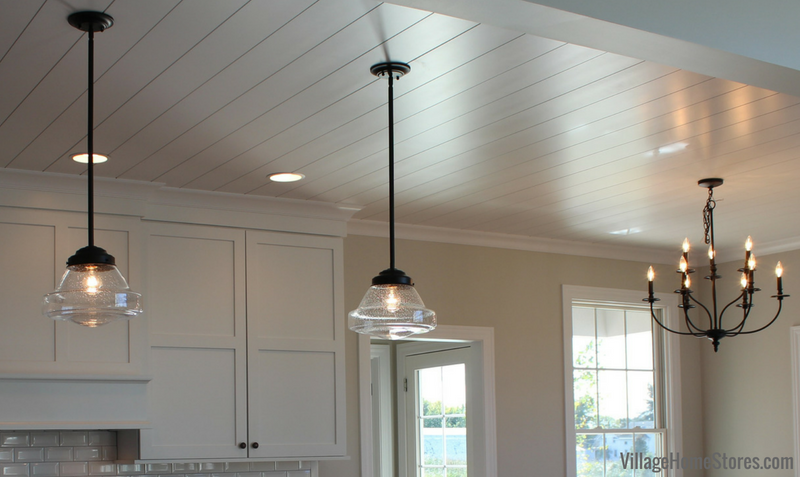 A shiplap ceiling treatment sets the stage for two schoolhouse-shaped pendants above the kitchen and a simple chandelier in the Dining Room. 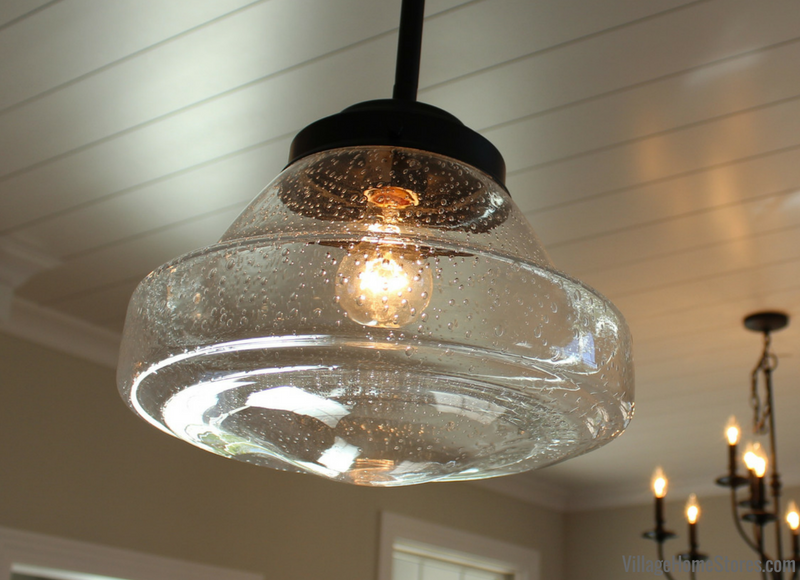 A seeded glass on the Feiss “Alcott” pendants diffuses the bulb brightness a bit and adds a fun texture. 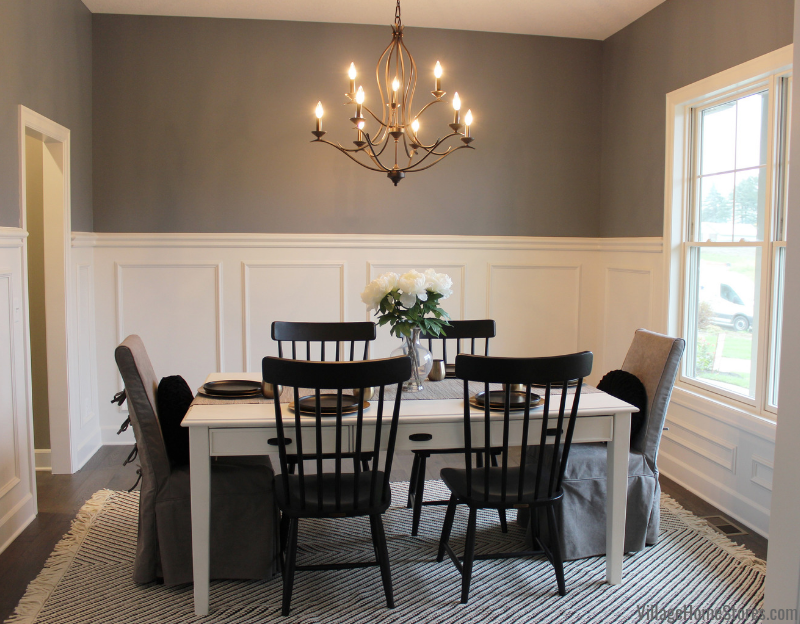 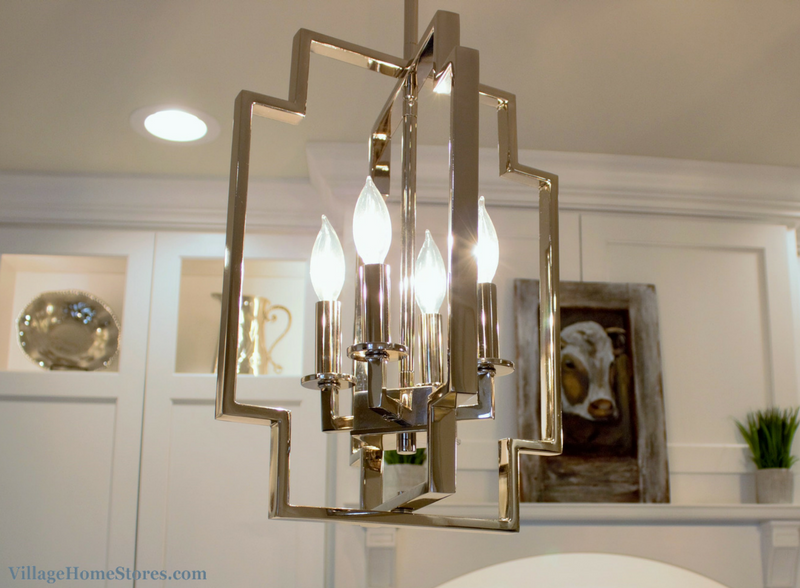 The 9-light chandelier in the Dining Room is named “Hartford” and is from our ELK line. 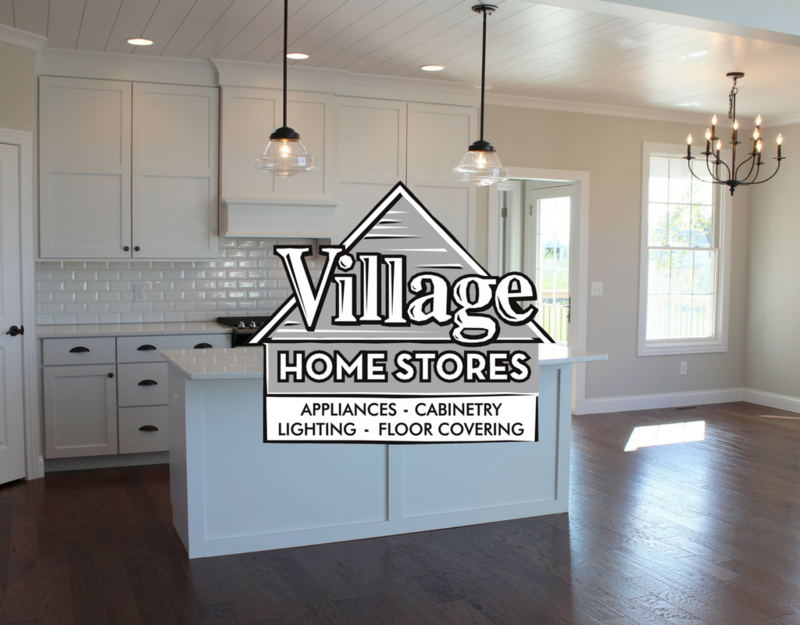 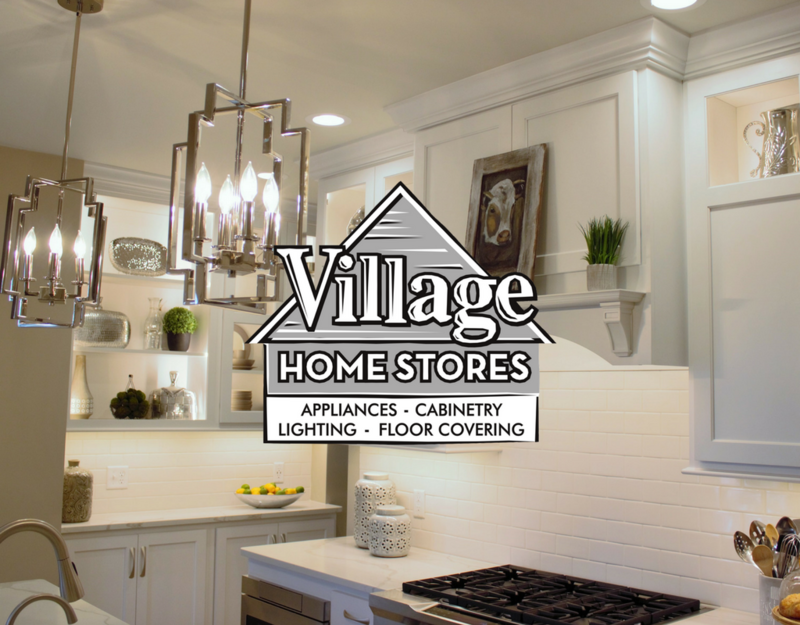 Don’t forget that when you are building a new home and purchase all of your materials from our store in multiple departments you can earn FREE lighting for your new home. 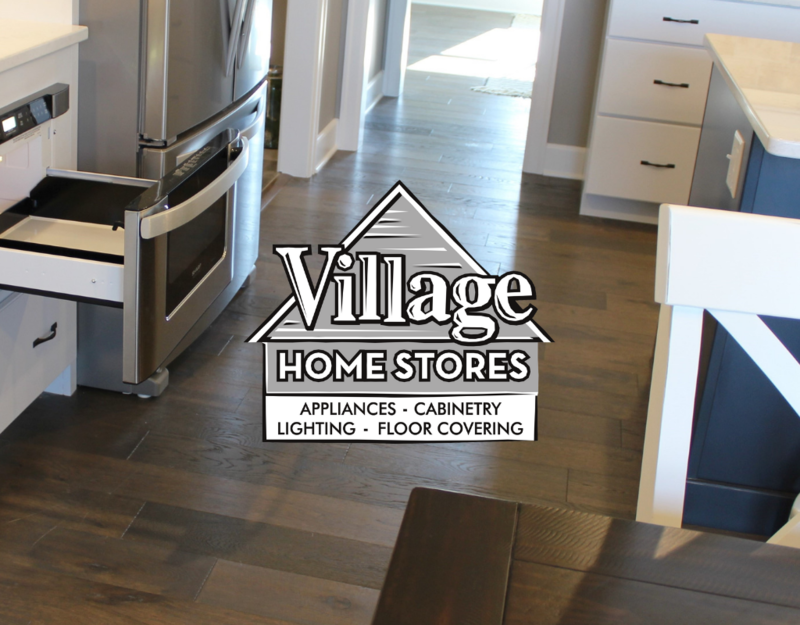 Learn more about that Bundle Your Purchases program here at our in-store promotions page. 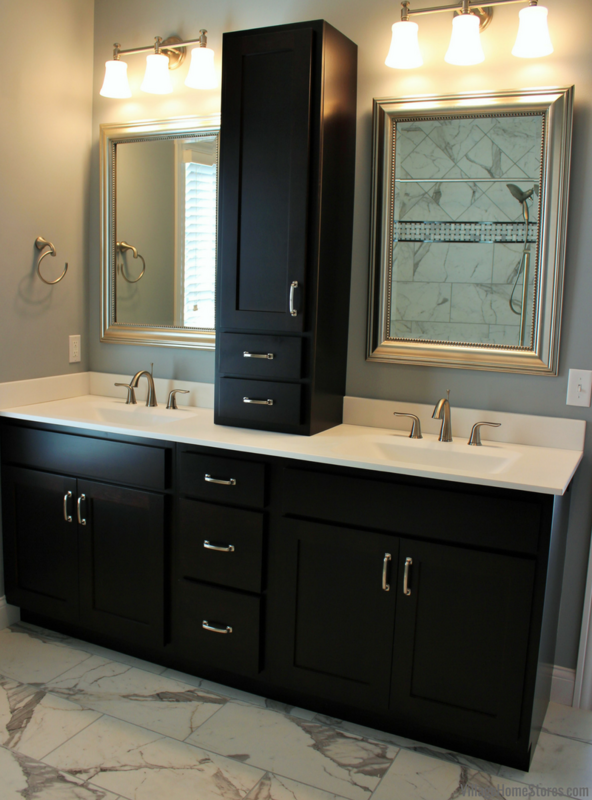 This home also had design and product in many other rooms including this Master Bath. 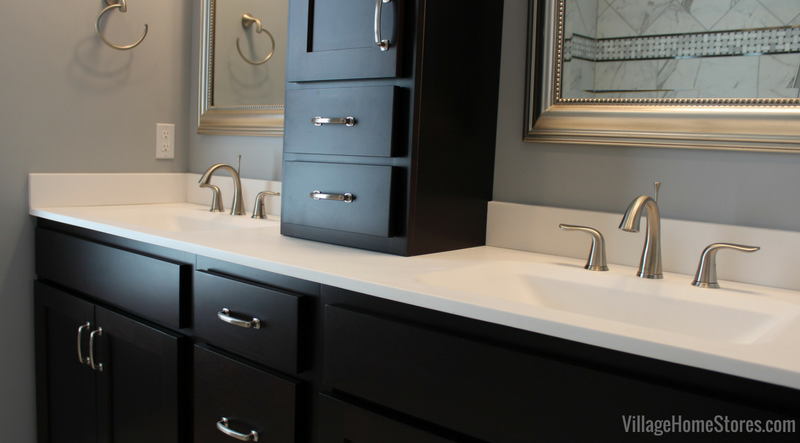 You don’t need a medicine cabinet to get great bathroom storage! 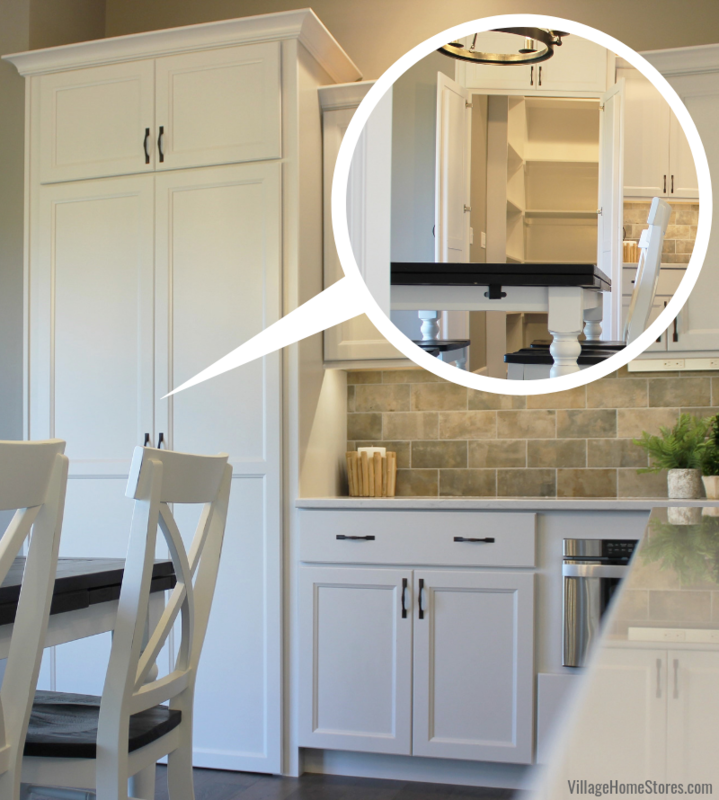 In fact… what can you even fit into a medicine cabinet anymore? 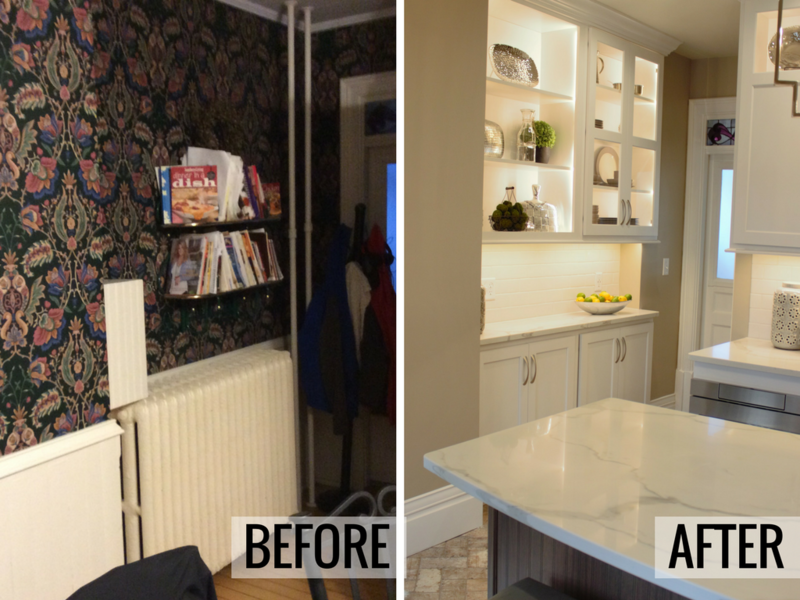 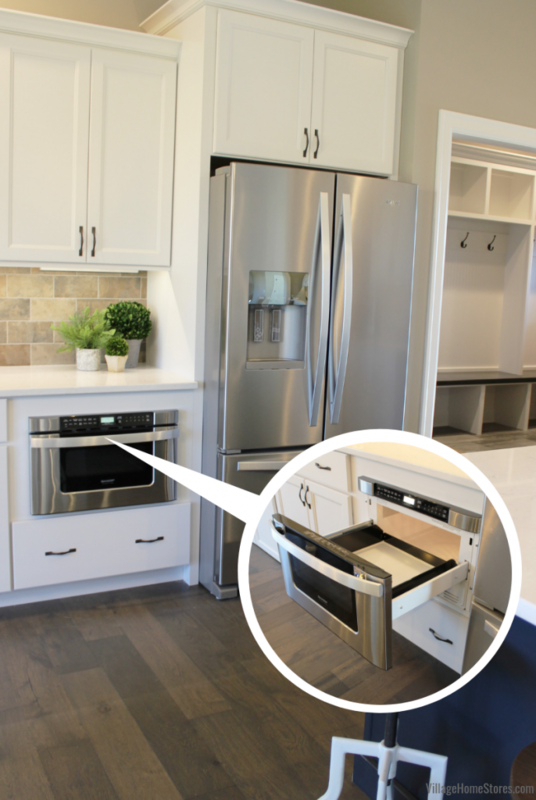 Go deeper with a wall cabinet that extends down to your countertop. 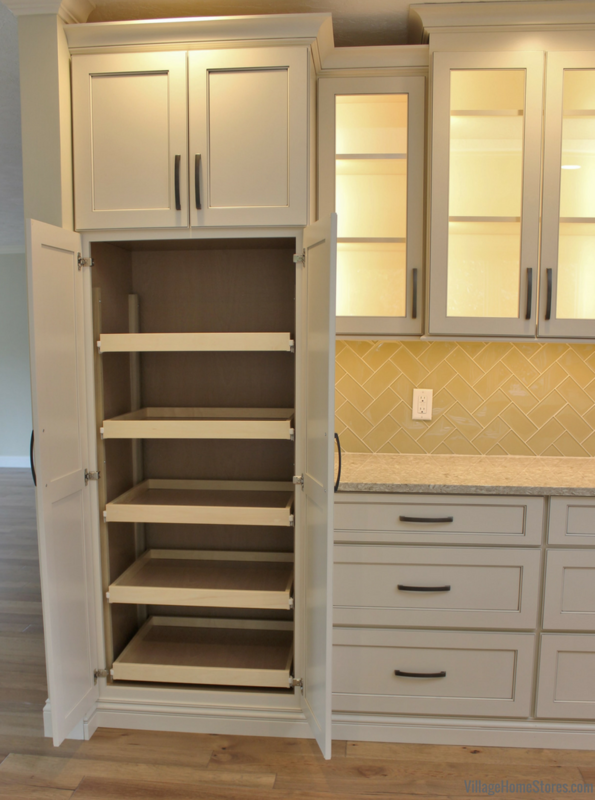 Added drawers for hair appliances and makeup are a wonderful touch. 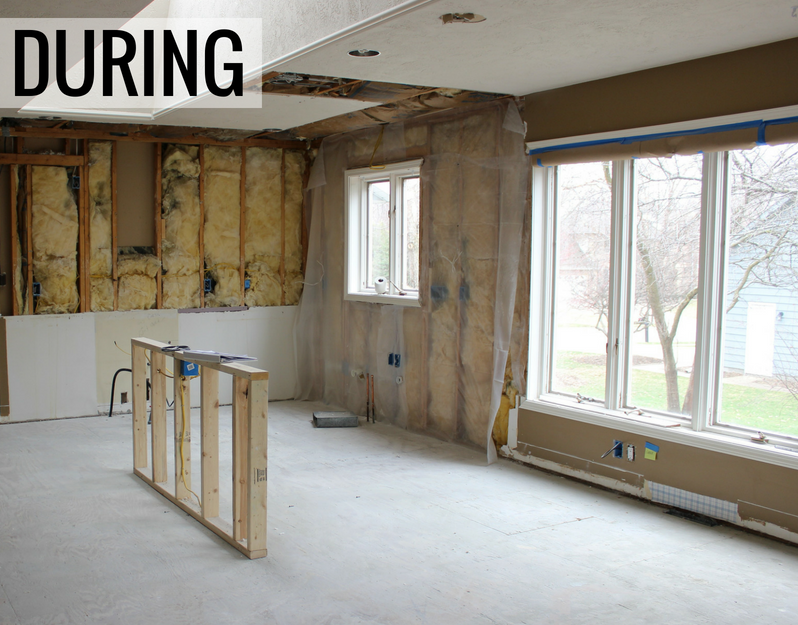 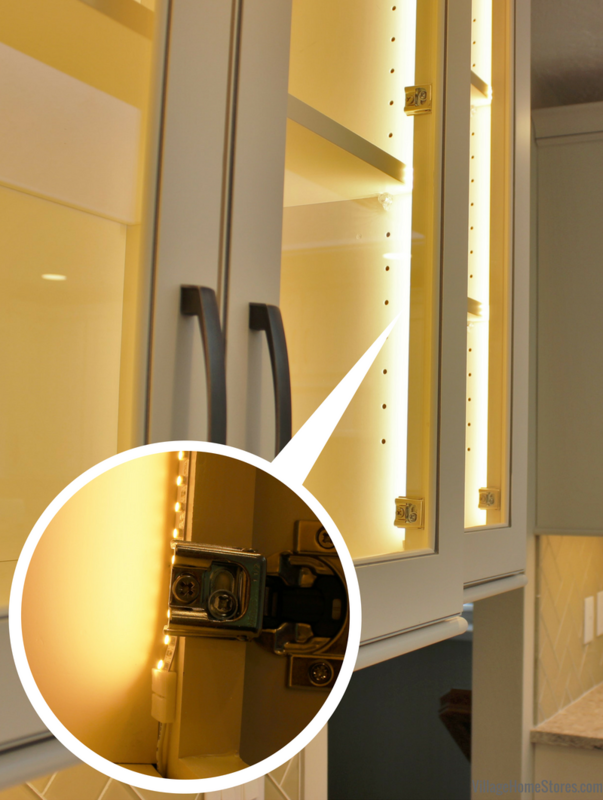 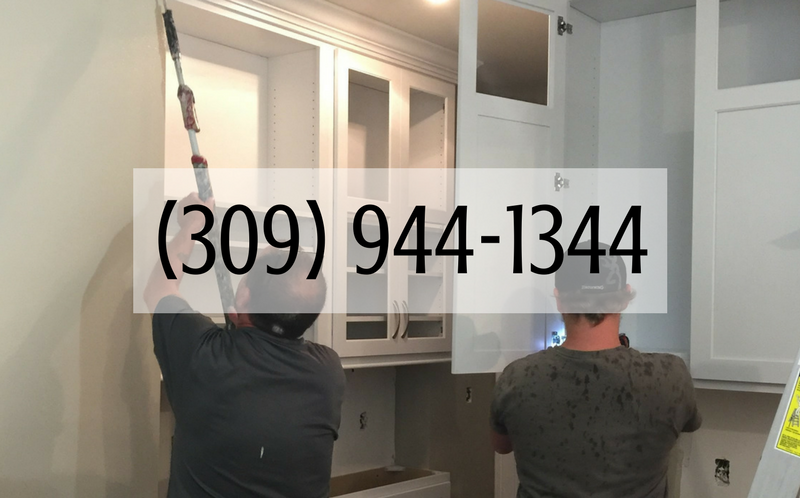 Many times our builders will even add an outlet concealed behind the door of the cabinets because you can never have enough outlets! 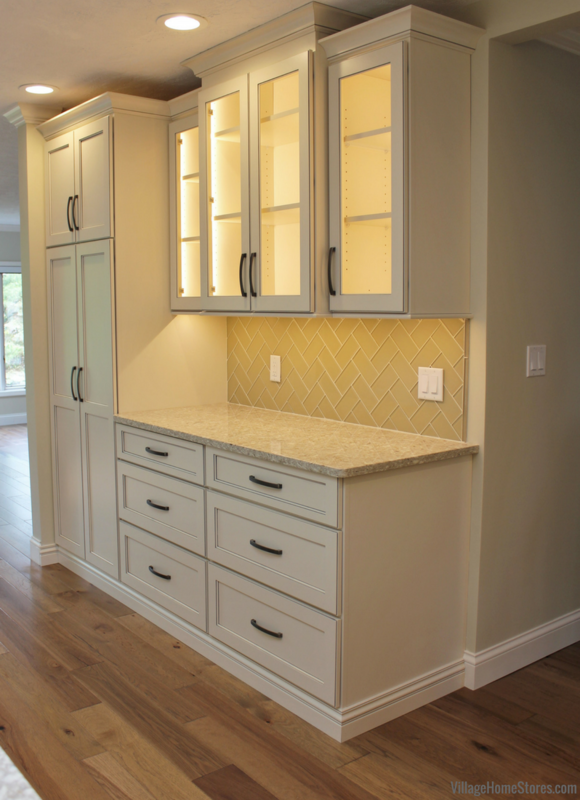 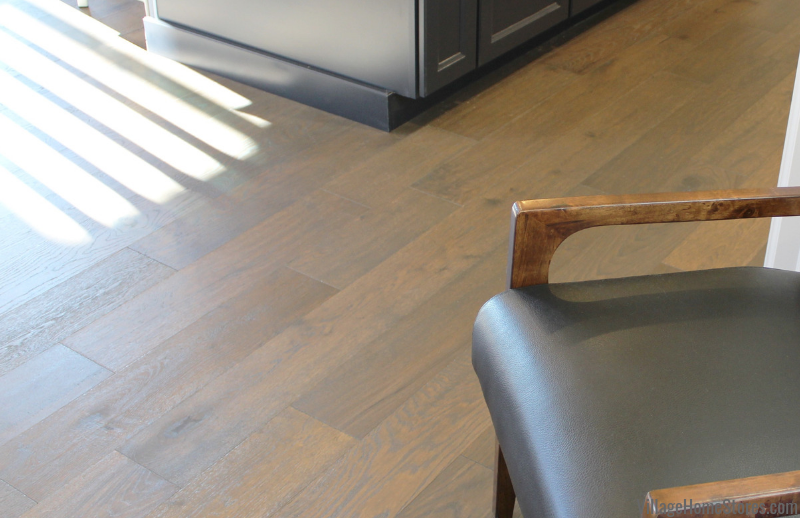 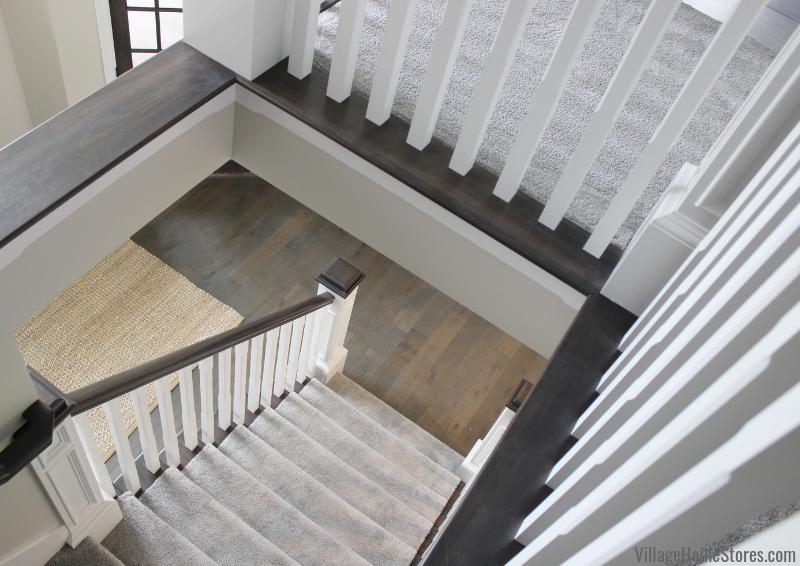 See the full album of photos from this project here on our Houzz page. 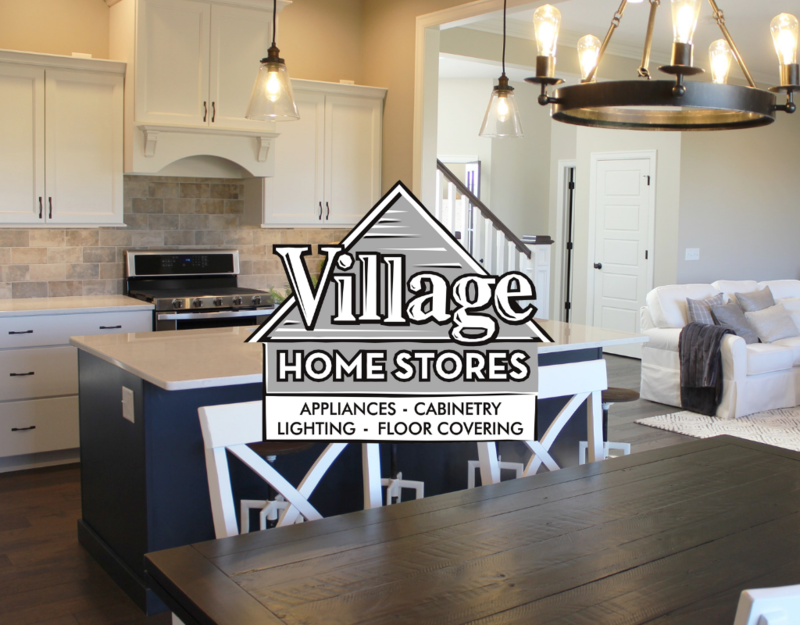 Have questions about the Bundle Program at Village? 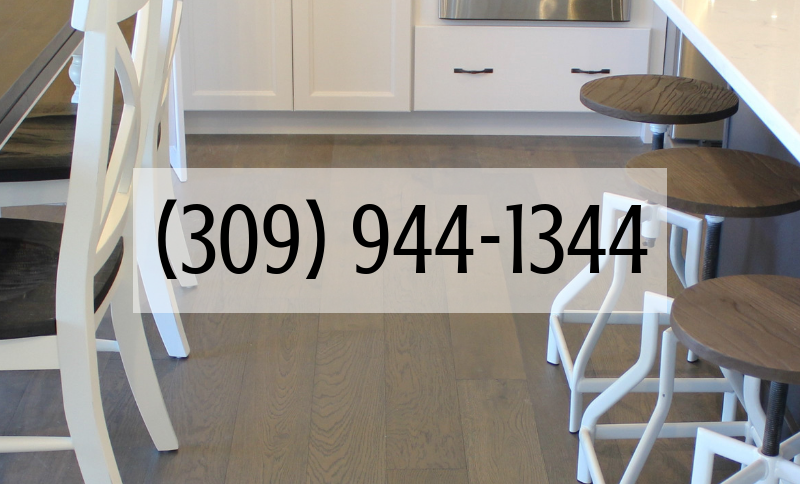 Contact our New Construction team with any questions about this or our New Build process. 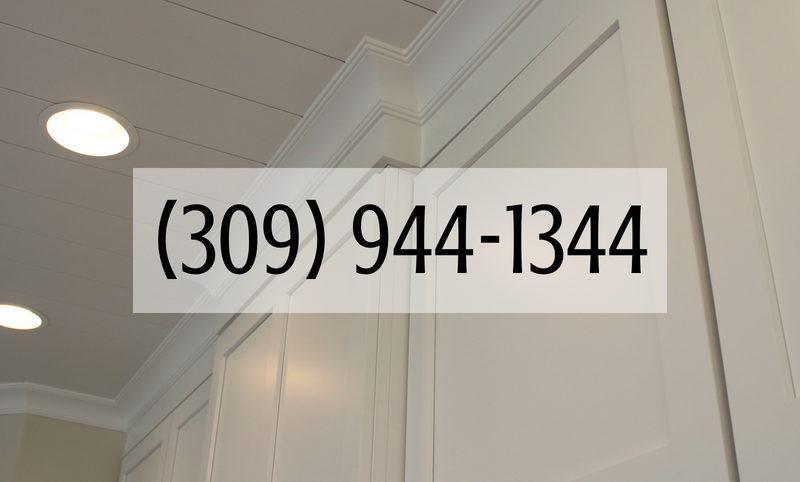 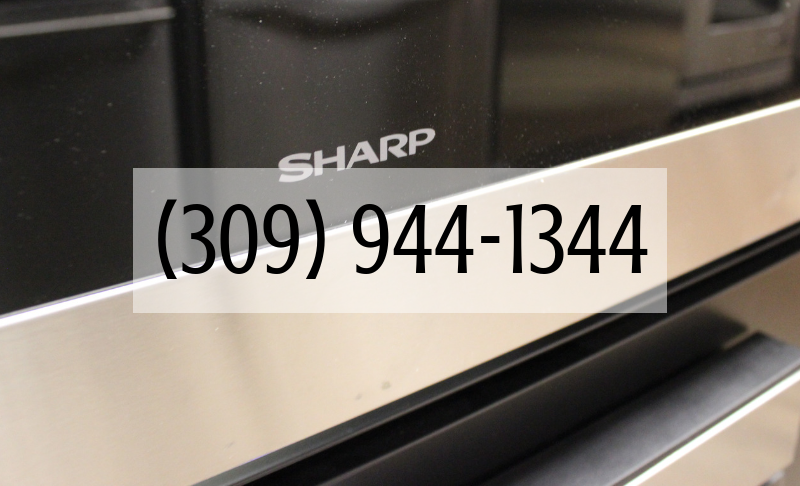 Reach us by phone at 309 944 1344 or complete this short online form and a member of our team will be in touch. 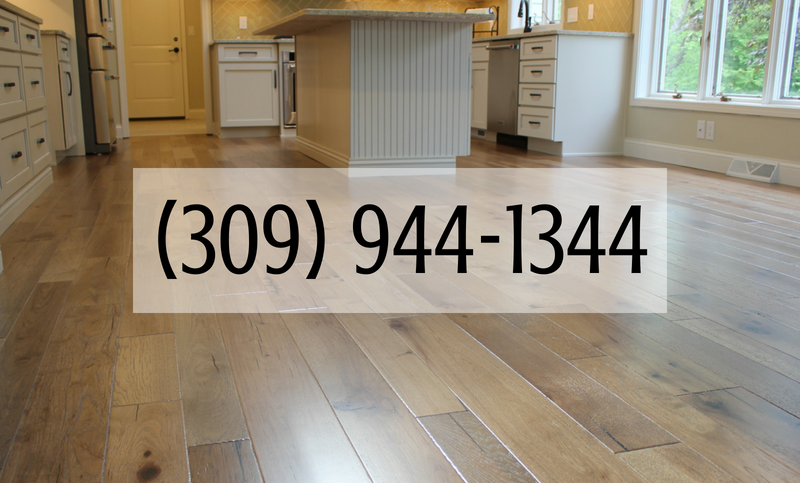 If you have any questions about Aspen Homes LLC or their process reach find them here on their website.